Queenstown, SA – Huntershill Safaris’ 55,000 acres is one of the Eastern Cape of South Africa’s larger hunting properties. A haven for wildlife, Huntershill features over 70 species for viewing or hunting in the semi-open bush and mountainous terrain. 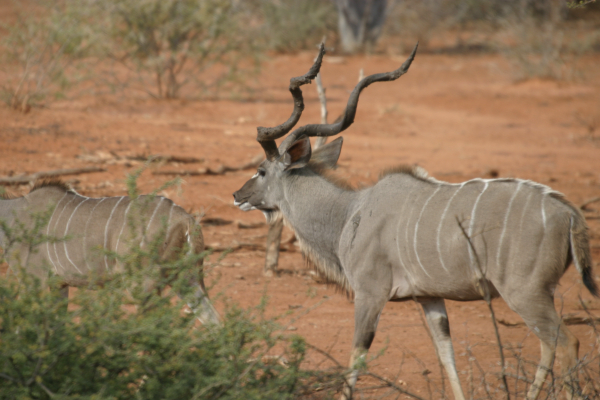 For those who may be interested in a different African hunt, the Rocklands camp is available. Rocklands’ 6175 acres are located just outside Fort Beaufort in South Africa’s Eastern Cape. Hunting is somewhat more challenging at Rocklands than Huntershill. The scenic terrain is less hilly and the bush is quite dense, so spotting and tracking are not easy. The game at Rocklands is plentiful but difficult to spot and shot opportunities can sometimes be quick. Most of the African species hunted at Huntershill are at Rocklands including some 70 buffalo, crocodiles and many large, but elusive, kudu. Water is plentiful. Rocklands has a charming seven-bedroom lodge overlooking a stunning African vista. All bedrooms have in-suite bath and shower. There is a bar, lounge and dining room, plus WIFI, swimming pool, boma and braai area with glorious views. Staff are brought in from Huntershill to serve the guests. Huntershill Safaris owner Greg Harvey acquired Rocklands in 2015 as an alternative hunting experience for his guests and has transformed the traditional farm into a hunting ranch. The farm was owned by the Campbell family since the early 1800s, and Peter Campbell, the most recent owner, oversees operation of the property. For more information on Rocklands and Huntershill Safaris email info@huntershillsafaris.co.za or www.huntershillsafaris.co.za.